I don’t particularly care for Alberto Contador, but I do like his name. No, I don’t want to change my last name to Contador. I would, however, still like to change my last name to Results. Paul Results. You want results? Go to Paul. It was an awesome day at CFS. As usual, there was a small crowd at the 8:45 and a very large crowd at the 10 session. All had been warned that today’s metcon was a scorcher. I can’t recall a time in the recent past when folks look so, well, defeated. Expect more barbell jumping air squats (and barbell jumping lunges) in the future, yo. HUGE crowd at Community WOD, and a good time was had by all most. 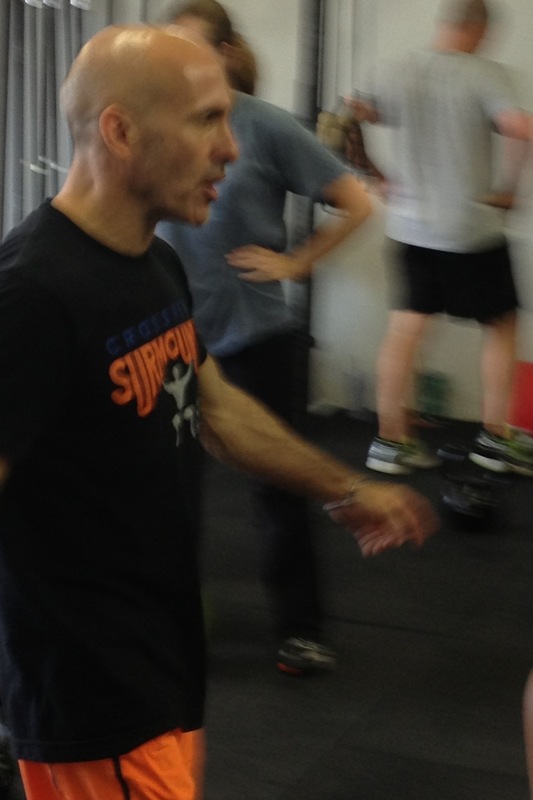 Jay once again graciously presented “Functional Movement” for the Second Saturday Series. Once again, the information was meaningful and well received. Thanks, Jay! You’re a gentleman and a scholar. Or maybe just a gentleman. Or maybe just a scholar. Steve and Griffin joined me for my workout. Both had attended the seminar but neither had yet worked out. It’s nice to not work out alone! Yes, this is the same format as “Fight Gone Bad”. Every time I do this type of 17-min workout I quickly remember how painful it is. I don’t have an accurate count of any of the reps, as I counted up each round. I do recall completing 20+ SDHPs each round, ensuring that I brought the bar to mid-thigh and then to the floor after pulling bar to clavicle — with elbows high and above the bar. 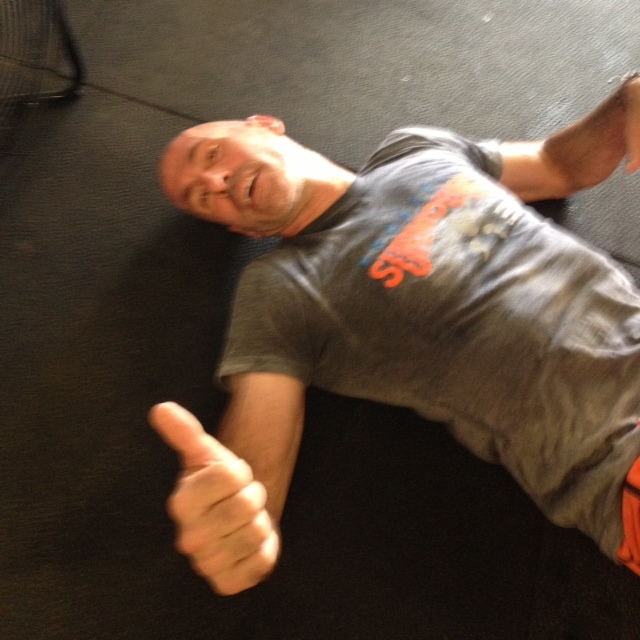 I completed most toes to bar kipping the first round, some the second round, and very few the last round. I was sweating so profusely that it was difficult to stay on the bar. Yes, my thumbs were around the bar. Uhm, pull-ups after toes to bar is just painful. Uhm, I really fell apart by the last round, often only completing 2 or 3 before dropping off of the bar. I hate thrusters. Did I already mention that? For whatever reason, however, I was quite successful with completing unbroken reps.
Pushups were somewhat of a struggle for no other reason than because I was exhausted by the 5th minute of each round. I completed 101, 93, and 81 reps for a total of 275. Steve’s and Griffin’s scores were 188 and 201, respectively. Apples to oranges to tomatoes. Griffin in the apple, I’m obviously the orange, and Steve is the tomato. Thanks for joining me, Steve and Griffin. You’re more than welcome to do so again!